St.Paul’s hospital is moving near to the downtown Eastside! 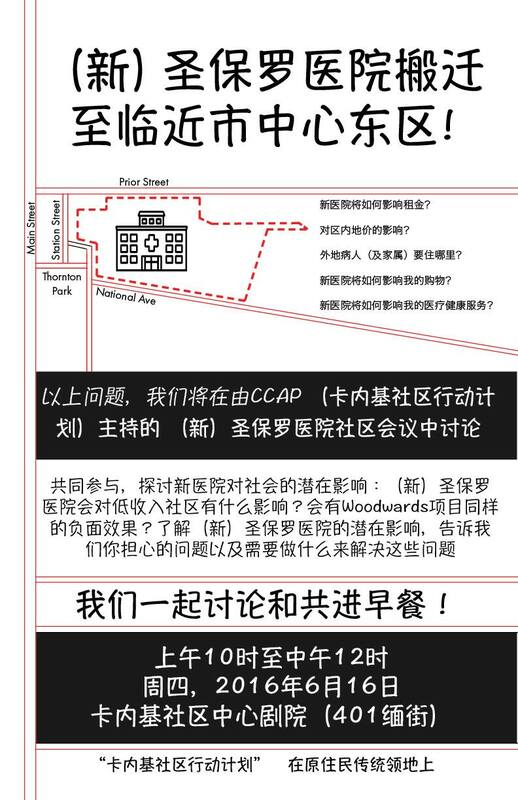 Will St. Pauls have the same effect on the low income neighbourhood as Woodwards? Join us for breakfast, learn about the probable impact of St. Pauls and tell us about your concerns. Together we will discuss what can be done to address the impacts of the new St.Paul’s hospital. – Where are all the patients going to stay? – What will happen to land values? – How will the hospital affect my housing? – How will the hospital impact my health care? – How will the hospital change Chinatown? The town hall will be translated into cantonese, and breakfast will be provided!